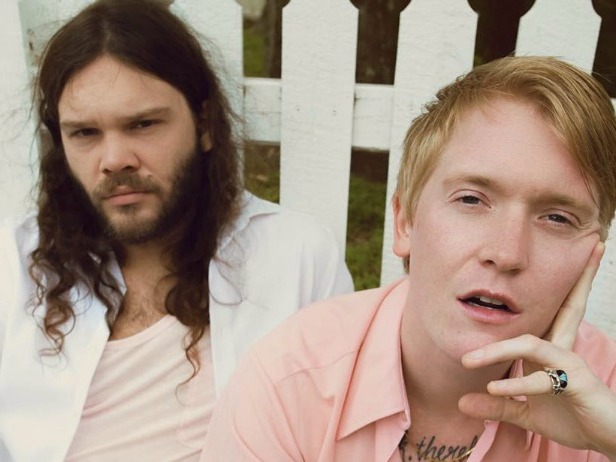 Nashville-based psych rock "collaboration" Okey Dokey is a relatively new band, (their debut LP, Love You, Mean It, was released in January, and their first single "Wavy Gravy" dropped a year prior) but the duo are far from strangers. Frontman Aaron Martin and guitarist Johnny Fisher were both members of the now nonexistent band, Sol Cat, where they played bass and guitar, respectively. After Sol Cat decided to call it quits, Martin and Fisher realized they were still meant to be making music together. The pair holed up in Johnny's cabin on the outskirts of Nashville, and crafted their unique sound. Okey Dokey take elements from all the best eras of music to make their peculiar, yet cohesive sound. Surf rock guitar riffs mingle with doo-wop harmonies, and new-wave synth lines. They're all tied together with a pretty lo-fi ribbon. Their latest single, "Hometown" is a Mac DeMarco-Temptations-Beach Boys wonderland. The catchy melody masks Aaron's lament of a situation everyone faces at one point or another: the dread of returning to your hometown. This infectious track might just be enough to make sleeping in your childhood twin sized bed a little easier.